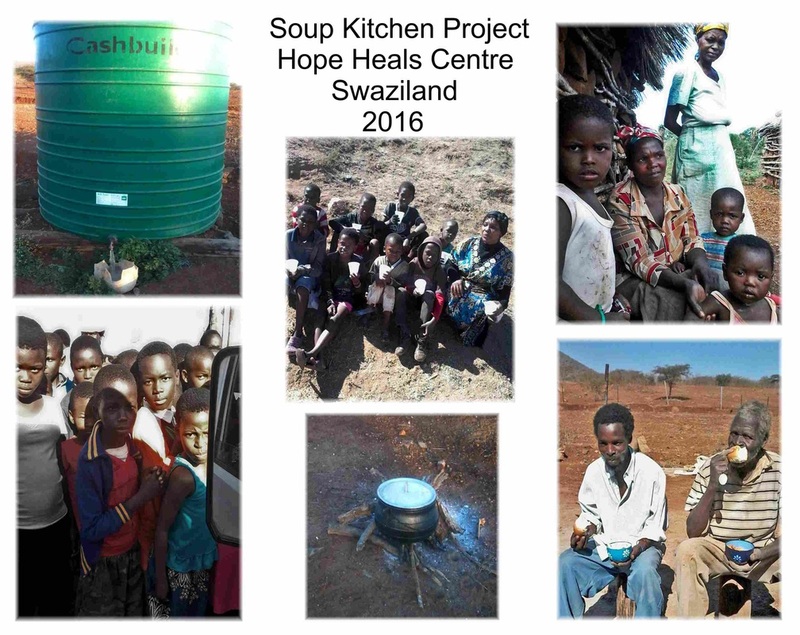 These are the first news and images sent by Sylvia Khuzwayo from Hope Heals Centre in rural Swaziland, as she has been busy setting up a Soup Kitchen project coordinated by Mwana Bermudes of Kanimambo Creations and financed by Plenty Canada. This program aims at feeding daily approximately fifty members of Hope Heals, a nutritious and high protein vegetable soup for the next three months. This humble but crucial relief food program will hopefully help them to survive until the rain season finally comes around October/November. "I'm trying to put things together and it's the water that is delaying us, however we have already began serving soup to a few people! This program is taking place in rural areas and most things are scarce to get, otherwise things are moving and Hope Heals is already making a difference even under these difficult circumstances. Thank you all very much for helping us out during these very difficult days! The members suggested that we will sometimes carry out a mobile soup kitchen so that we can also reach those people who have given up and don't want to be seen in gatherings because of their poverty situation, as some don't even have clothes and have decided to isolate themselves. This particular family of 11 members share a room hut which is practically falling apart. The mother of the children is HIV positive and she is not doing well on ARVs (AIDS medicine) because sometimes she does not take her medication, reason being the long distance between her homestead and the local clinic, as she will have to walk 38 kms on foot. Another reason is that sometimes they don't eat anything at all for days, and that causes her to throw up when she takes her medication on an empty stomach. The youngest of her children is one year old, born at home and tested for HIV due to her mother breast feeding her. The great news is that we finally got water delivered this week thus filling our own reservoir at the Centre! So we have been busy giving away our soup to children in the community all this week. The situation is terrible though concerning the youth as on top to worsen it there is currently a high rate of teen pregnancy and contagious diseases are spreading like wild fire. People are very hungry here in the rural areas and the suffering from old people who are now care takers for the orphans is rather depressing too as they barely can survive on their own. This week I had to change the strategy of serving bread+soup to maize porridge+soup as the number of people needing help is larger that we thought. The maize meal can at least produce porridge for more people than the dry bread could for the same price. Vegetables are also so expensive now because there is still no rain and very dry until the rain season comes hopefully in a few months. As you can imagine it's been very heart breaking to say the least, while carrying out our Soup Kitchen activities but also very rewarding to know that at least we are able to perform bravely our duty in order to improve the conditions of few of our people who hopefully will survive throughout these very difficult times. We thank you all again for all your support and hope that you are kindly giving us, and pray that you will continue to do so until we can again start harvesting fresh produce from our Centre." Syiabonga buthi Mwana, sis Yara and everybody at Plenty Canada! 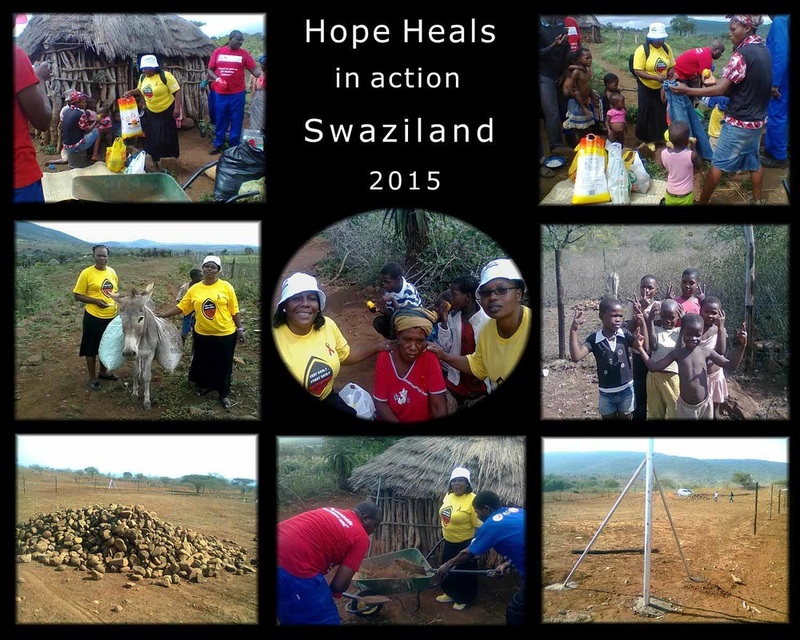 Sylvia Khuzwayo, the founder of Hope Heals has recently sent us these images from Swaziland. This activity is part of our vegetable production project initiated by Sylvia in the rural communities of this beautiful country where Hope Heals has been working for several years through their HIV/AIDS support program. The project has been financed by Plenty Canada, a few good friends of ours in Canada, USA and Portugal, and coordinated by our local organization Kanimambo Creations. Thanks for visiting us and enjoy the show! 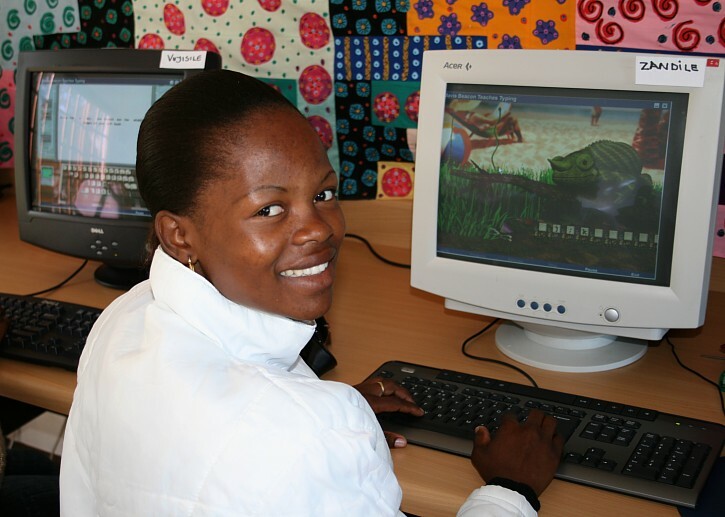 Sylvia Khuzwayo is the founder of Hope Heals organization in Swaziland, and she's herself a brave HIV positive lady. With her enthusiasm and active life to help others she has become a living inspiration and living example for many to survive the pandemic with a positive attitude. Hope Heals has been carrying out a number of projects within the rural communities of Nhlangano area educating women and men on HIV issues, and most of all establishing support networks for people living with HIV and helping them stand on their own feet again after starting ARV treatment and consequently to live long and productive lives. 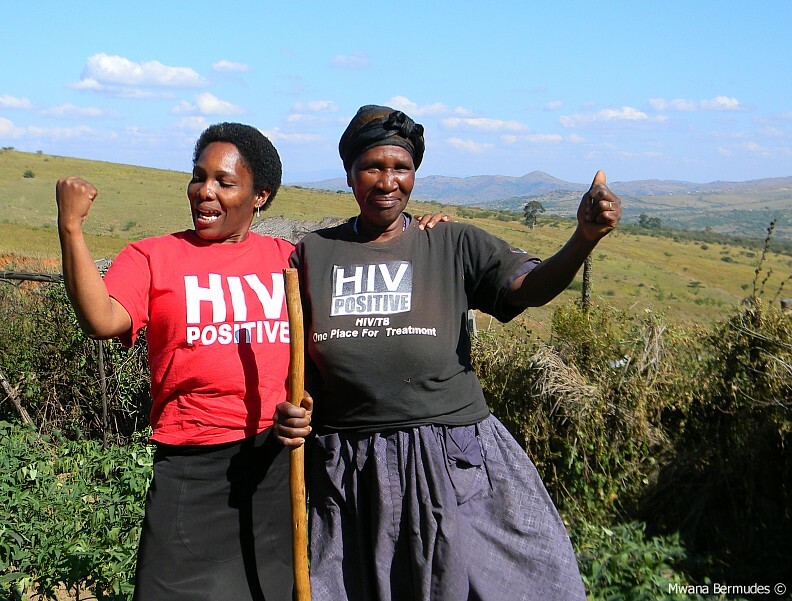 Their volunteers regularly visit people in their homesteads to encourage early HIV testing, TB screening, adherence to treatment and positive living for HIV positive people. To be around Sylvia is a unique spiritual experience and we always come home inspired and full of hope that the world could be a better place to live in, despite all the misery so many of our people unfortunately live through in their life time in this part of our planet. Swaziland is one of the most beautiful Kingdoms, in Africa, its people steeped in culture and traditional pride. Sadly the people are still fighting poverty, lack of basic needs like water, and the rampant HIV/AIDS. However if they are able to receive treatment and help, they may survive and work and hopefully become self-sufficient. In February 2012, with the kind donations of PLENTY CANADA, P.O.W.E.R and special friends, Mwana Bermudes went out with Sylvia Khuzwayo to purchase the basic implements for survival for several of these families decimated by HIV but living with courage and determination as examples to others. Hope Heals has been assisting Doris Shiba to strengthen a community therapeutic group she initiated within her community. She has 36 members already and with Sylvia's assistance she is in the process of officially registering the support group as the Swaziland National Network for People living with HIV/AIDS. Sylvia has selected the Shiba family as a pilot project. _ Doris Shiba lost two of her sons from HIV/AIDS related illness. She now looks after her ailing husband, sick with TB, and her grandchildren and great grandchildren who are these orphans of the next generation of Africa. Doris's two sons were the home breadwinners and she has been struggling to make ends meet since their tragic death one after the other. She still has a daughter who left her only child with Doris long ago as she went to look for employment far away from home and has not returned yet. As Doris is very energetic and positive, she has a beautiful garden full of vegetables, fields of maize and pumpkins and keeps chickens for eggs. The only water supply is over 3 kms from their home, so she has to carry 25 liter containers on a wheelbarrow to bring it home! These home gardens will be irrigated by the water caught in the tanks from the newly placed gutters. The work to install the tanks, gutters and fences will be carried out by volunteers from the community under the supervision of Sylvia Khuzwayo. 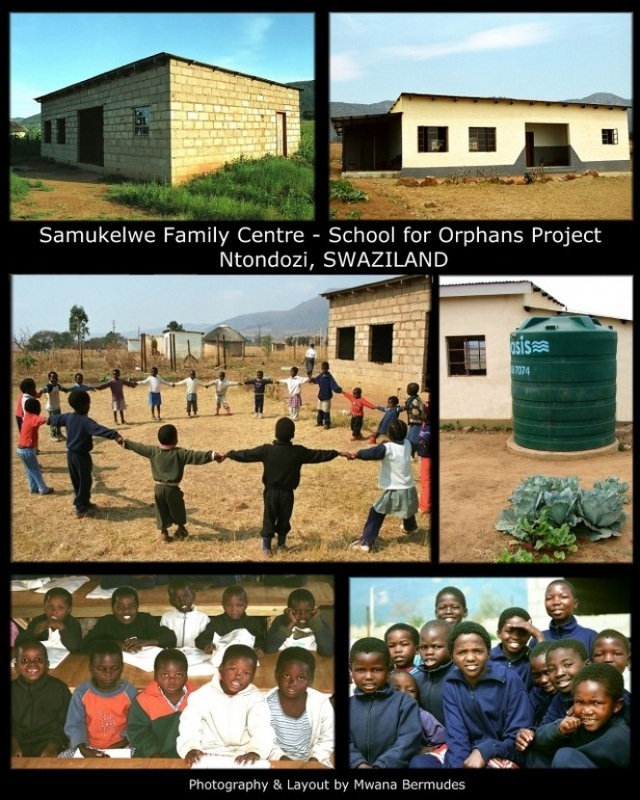 This basic technical and financial assistance will help a family like the Shiba's to grow & produce their own food, and with availability to clean water for both consumption and irrigation, these orphaned children will have a better chance of survival as the next Swazi generation. Giving hope and a better future to this family will also serve as an example to others, that being the aim of Hope Heals. ​According to our original proposal, the main work plan was to complete the existing building which had no concrete floors, windows or doors. We already had contacted a well known local building contractor, Henry Dlamini, and after discussing the project and negotiating his proposed wages, we hired him. He then took over the daily operational activities at the school, also employing a couple of the village people to assist them with basic labor, and a couple of women to cook the building team meals. Mwana coordinated the project implementation, from purchasing and delivering the necessary materials to site, to the technical supervision of the project. The work started in mid-August and by the beginning of October was successfully completed. A real record time with outstanding professionalism !​We are really impressed with the response from the Ntondozi community who contributed to the great work carried out on behalf of their orphans and vulnerable children. We now confirm that the Ntondozi Youth Association and some key members of the village are highly motivated, which is a real inspiration for other communities in Swaziland. 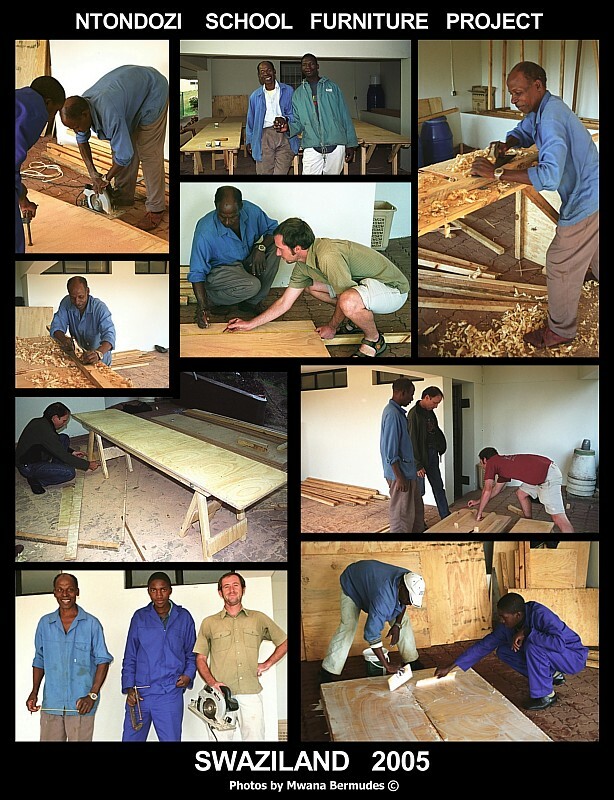 We also believe that this type of project is not charity but simple solidarity, directly empowering the outstanding Ntondozi community members with better tools to do their difficult and compassionate work. On behalf of the Swaziland people, we truly thank everybody at the J. Kirby Simon Trust for their moral and financial support. 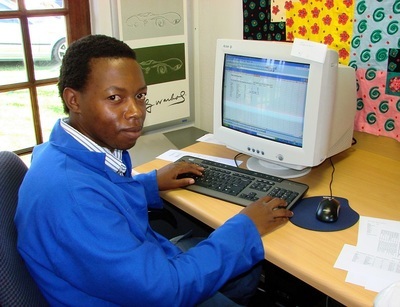 Through our development work in Swaziland I have the privilege of meeting talented young people who in some cases are very motivated to further their education. 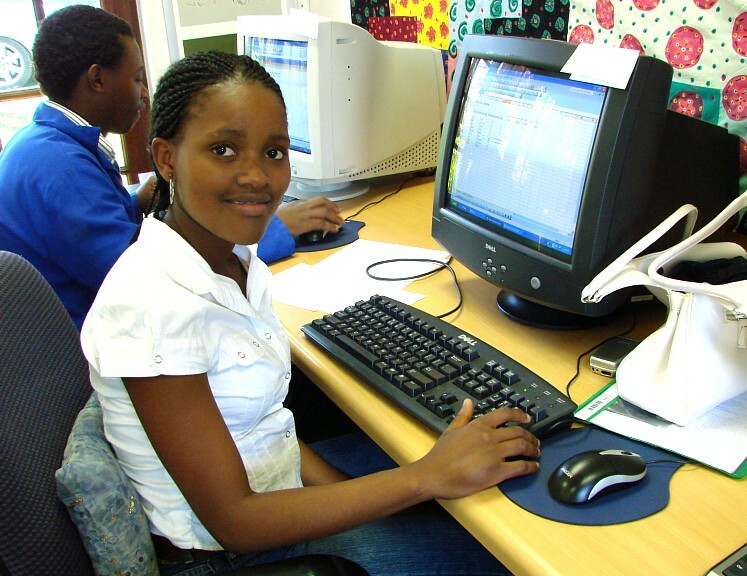 After conferring with them and considering our limited budget, we came to the conclusion that the best alternative would be to enrol them in training of basic computer skills. As Kanimambo Creations managed to fund raise for several of these basic courses, we contacted a local computer training firm and consequently several candidates successfully completed their diplomas in basic computer training. 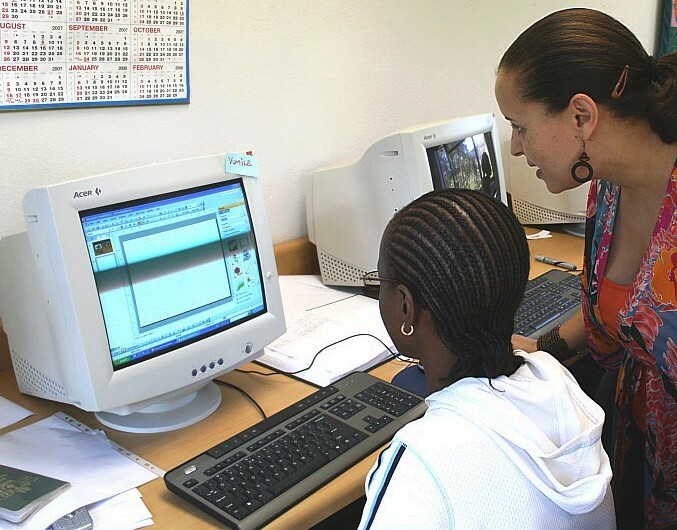 Their kind and dedicated training teacher was delighted and very proud of all her students, even extending their training classes in order to facilitate the use of the school's computers, as most of the students cannot afford a computer at home. All the students are very grateful to have such an opportunity and we feel privileged to assist such talented African youngsters, the majority being young women. As a result, several of them have already found new jobs. We are very grateful to all who have financially supported this program so far, such as the Mbabane Film Club and other good friends from all over the world.